Back in May, I was extremely fearful. I was terrified, in fact. 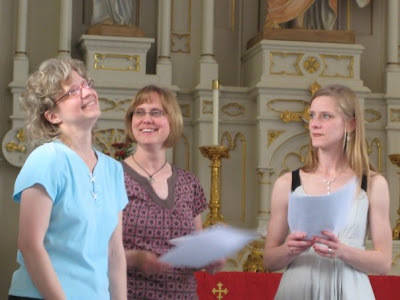 My sister was getting married at the end of the month, and she wanted us to sing at her wedding. By us, I mean my mom, my two sisters, and me. I have stage fright. I try to get over it, but it seems like I sing best in a choir, where my voice is masked and covered by other singers. Ed and I sing duets at church as well, and the last time we sang, we both had colds and our voices just didn’t cooperate. Our mom has a beautiful voice, and she has sung in public for years. She sang at weddings, for funerals, in choirs and even in the chorus of an opera. So when we sing together with our mom, she gives us courage. She leads us, and we always sound good with her as our leader. Just a few weeks before the wedding, however, Mom decided she was just not strong enough to attend the wedding. She is battling breast cancer, and her recovery has been steady but difficult. Many tears were shed over her decision; mostly because we didn’t want our mom to miss this special day; but in the end we also want Mom’s healing to continue. We agreed that although it was a painful decision, it was for the best. I don’t brag often enough about my sisters. I’m extremely proud of both of them. Heather, the sister who was getting married, is an art professor, and her art appears in galleries all over the country. My other sister, Meredith, is a music professor, and she composes choir and instrumental pieces which have been performed all over the country as well. The piece we were going to sing was arranged by Meredith for four voices. She scrambled to make changes so the three of us could sing it without it sounding too disjointed. We focused on the notes; the harmony; the music. We made it all come together. But the fear wasn’t there; we weren’t afraid to sing wrong notes in front of each other, or to bungle the rhythms, or make a bad entrance. We worked out the bugs and managed to sing quite well for Heather’s wedding. We made a DVD of the wedding for Mom, who cried when she saw us singing. With my sisters by my side, I don’t need to have any fear. They support me through bad times and good times. When I was diagnosed with breast cancer, Heather buzzed her hair in support of my baldness, and Meredith kept me from knowing how scared she really was inside. They have rejoiced with me when I announced my pregnancies, and have been the best aunts imaginable to my two little girls. When I’m with my sisters, when I’m with my entire family, the circle of fear doesn’t exist. We don’t always get along; we have had huge hair pulling, drag out fights. But there’s no fear. We always hug, say we’re sorry, and our circle, the circle of family, strengthens us and makes life a little less scary. That is so great that you are so close with your sisters and can share your talent together! This makes me wish I had sisters. I guess I am lucky to have awesome friends who feel like sisters. Recent undefined:=- Oh no! Comluv had an error with your feed, see message below! That's a great photo of you girls! What a sweet story. I bet your mom was so blessed to see you go through with it. I love the "circle of fear" analogy–I just may have to steal it sometime! ;)Recent blog:=- To all those who doubted me: Well, it turns out you were right. wonderful post!Recent blog:=- New Winner & Next week's Prize Announced ! What a cute shot of the three of you! I'm glad you got to sing together and even more glad that your mom got to see the video. Now show it to us. Recent blog:=- Follow Me. This was beautiful. I'm so glad you were able to share such a beautiful moment together as sisters. you all look so sweet!I hope your mom begins to feel better soon.Recent blog:=- The Peon . . . or is it 'pee-on'?